Corrode-Blok™ is a revolutionary technology developed by Budge Industries, LLC to actively protect all metal parts from the damaging effects of rust and corrosion. Our patent pending material is embedded with a Volatile Corrosion Inhibitor. 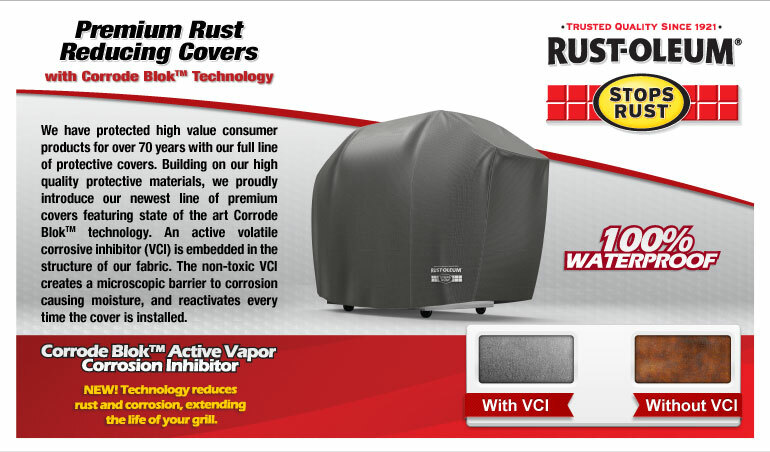 This active protection travels from your cover and creates a microscopic barrier on any metal component. The inhibitory evaporates upon removing the cover and reactivates each time it is installed and provides corrosion resistance for up to four years! Corrode Blok™ Active Vapor Corrosion Inhibitor (VCI) Technology reduces rust and corrosion, extending the life of your Vehicle. Rust-Oleum® is a registered trademark of Rust-Oleum® Brands Company used under license by Budge Industries, LLC. ©2013 Rust-Oleum® Brands Company. All Rights Reserved. Why is Budge partnered with Rust-Oleum? Budge, the original car cover company, has manufactured premium protective covers for 70 years and Rust-Oleum® is the number one brand for protection from corrosion since 1921! We have combined our shared expertise to bring this new, exciting and innovative material technology to the protective cover markets!